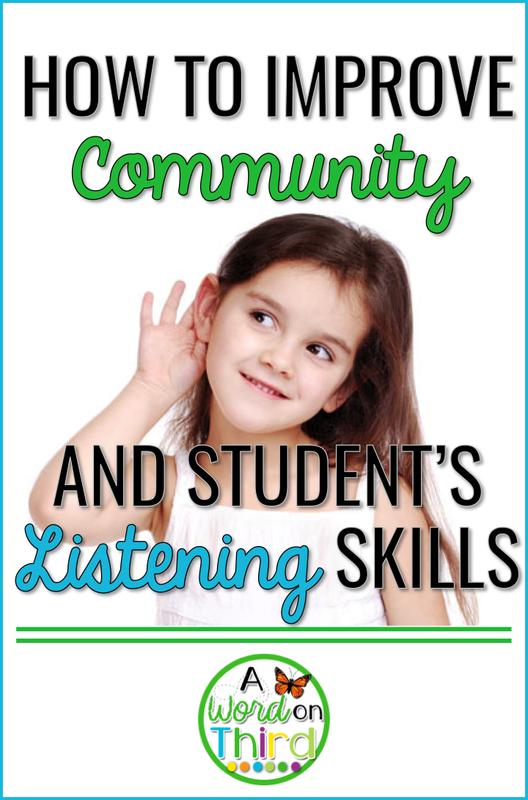 The sharing component of Morning Meeting is the perfect time to enhance students' listening skills while simultaneously strengthening your classroom community. Yes--you really can do both at once with this trick. A dialogue share is when a few students share about something in depth. You might give students a topic to share about, or they might come up with their own. A partner share is when students share with each other. Like a dialogue share, you might specific the topic of discussion, or you might not. Around the circle sharing is when every student shares by going around the circle and taking turns sharing the answer to a question. It might be academic or not. Here's the simple trick I use for building listening skills during a share session. After the sharing is over, I ask some "Who remembers?" questions. For a dialogue share, you might ask a specific question about a particular student's share. "Who remembers what Martin was hoping to get for a birthday present this year?" "Who remembers what Iva did on her trip to Mexico?" For a partner share, I usually just ask students, "Who remembers what their partner shared about?" This also allows the class to hear a few things from other partnerships that they didn't get to talk to during the share. The best part about this is that Who Remembers can be done in a minute or less. You can ask these questions with any words you want: "Who learned something new about a classmate today?" You can even make it apply to your academic lessons, which helps your students to feel good about themselves too. I'll use this strategy a lot during the connection portion of our lesson. "Who remembers that awesome crafting move Somya told us she made during the share of yesterday's lesson? We're going to learn about it today!" or it might be as simple as "Who remembers what we did in reading yesterday?" My final word of advice is that if you use the "Who Remembers?" strategy, try not to repeat things a million times or do student voice-overs (when you repeat exactly what a student says). Say your words once (or let the student say them once) and let them have power! Are you game for trying this? What are your listening tips?